Skinny is Shorty’s twin sister. She has some Siamese in her, you can tell by looking at her and when she MAOS! She’s a thin cat, thus her name, and has a bad attitude at times. But, she’s my little buddy and has been my constant companion for 15 years, going on 16. She’s now “Top Cat” and lets everyone know it! She wants to attack the red dot, loves her catnip fishy and enjoys naps and petting. Known as The Pharaoh, she has her own throne she likes to sit on. 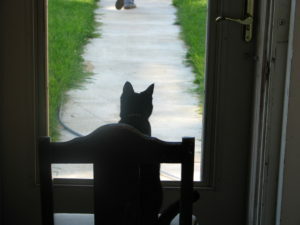 It’s on the front porch, so she likes it to be set up in front of the front porch door so she can survey her kingdom! Skinny The Pharaoh surveying her kingdom on her throne.